Not to beat a dead horse, but since this was not my first run at Gencon, I figured it was worth sharing my thoughts as well. 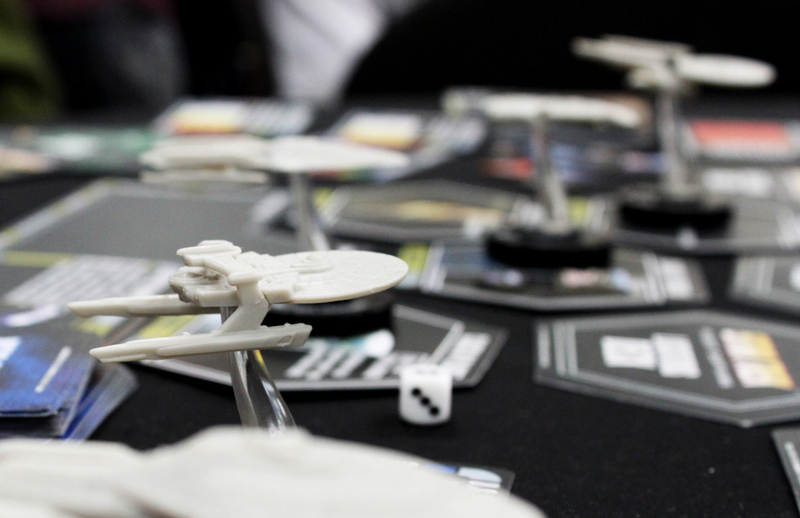 If you read yesterdays post you already know that myself, @Farmerlenny, and our friend Blake, all attended Gencon over the weekend with many thoughts towards finding and playing new games to share with our readers here. We hit up the floor friday and saturday, saw a lot of sights, and played a lot of games. Here are my thoughts, and a coupla photos. 2. Silliest thing that happened that benefited me: There were two separate booths dedicated to Rio Grande games. 1 booth had dominion & expansions for $30, the other had ’em for $25. Then the first booth dropped to 24, and the second followed shortly after by dropping them to $22. Cornucopia and Alchemy were even cheaper at $18 by the end, so I scooped up that deal. 3. biggest disappointment: Speaking of Rio Grande booths, both were offering dominion promo cards with a purchase. But apparently the only one they were willing to give to me was the “blank” promo card. twice. I don’t understand why, but as I could see stacks of the other promo cards on the shelf and asked nicely for a change-up the second time, I was pretty disappointed. 4. 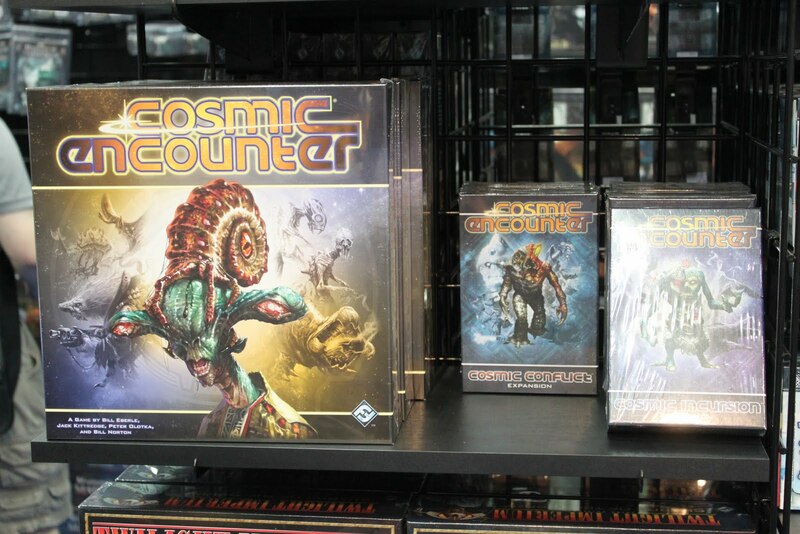 Most exciting news from Gencon that I actually missed and heard about afterwards: I’m a big fan of Cosmic Encounter and have had some interactions with some of the creators, who seem like pretty cool guys. They also created a Dune board game, which is now long out of print and very hard to find, but which sounded incredibly fun. Unfortunately, the Dune license has been impossible for any publishing company to get, so the Dune game itself hasn’t seen a reprint. But the game mechanics and rules are still owned by the creators, and with the upcoming release of Rex by Fantasy Flight, the old Dune game will see new light, though re-skinned with the Twilight Imperium universe. 5. 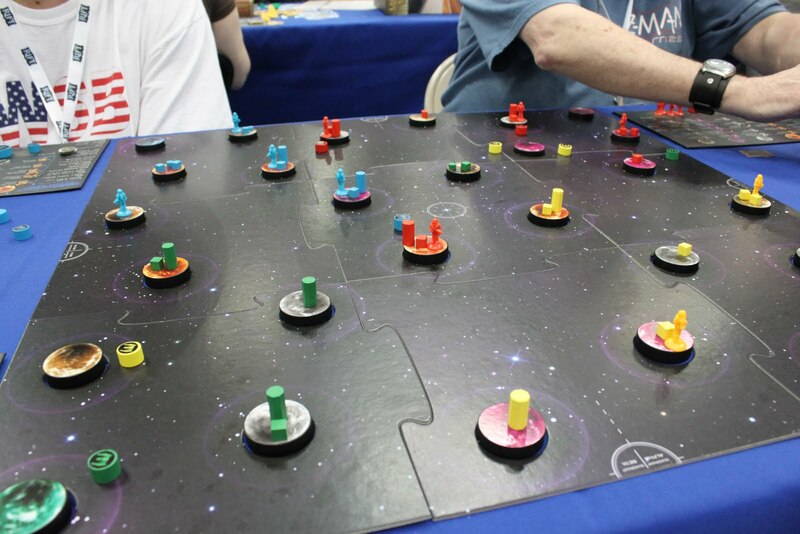 Surprisingly fun game that I ended up buying: I love space games, but I’m definitely a strategy gamer over anything that requires any sort of dexterity or doing anything, you know, physical (when referring to board games.) So I wasn’t too thrilled when we started trying out Ascending Empires, a space game in which you move your ships by flicking them across the board. However, after getting into the game, it turned out to be super fun, and it went from game-I-cared-little-about to game-that-caused-me-to-exceed-my-budget-slightly-because-it-was-too-good-not-to-purchase. Thanks to the guy with the meeple earring for teaching us. 6. Hooray for nerds! 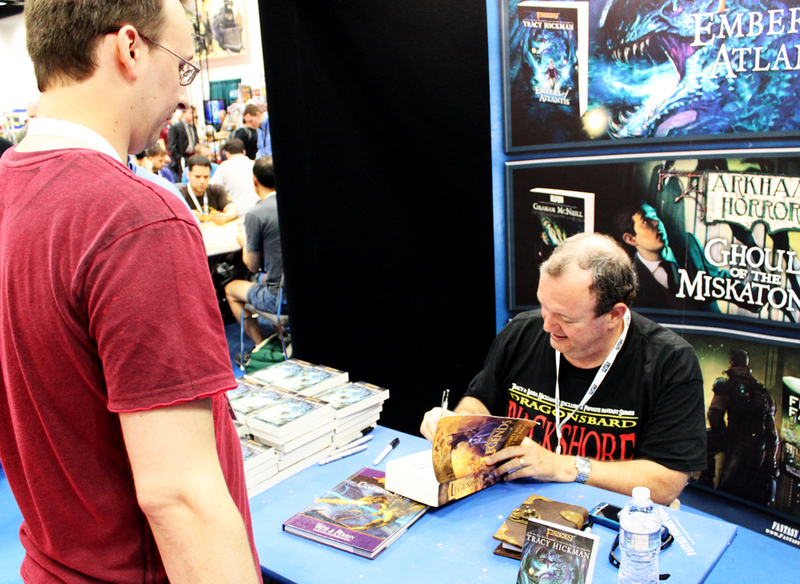 Somewhat-famous-in-the-geek-world authors Tracy Hickman and Margaret Weis were in attendance. Blake, being a big fan of the dragonlance series (written by those two authors) managed to get autographs and photos with both of them. And, unlike many celebrities attending cons, They didn’t charge him a dime to do so. Hooray for nerds. 7. Not paying to play: One of the most annoying things about Gencon is that table space is at a premium. You generally have to pay for a table to play games at in order to not risk getting kicked off to make room for scheduled gaming events. I’m not sure how it’s cool to pay for table to play games you already bought, but we found a nice little lobby area with tables and chairs just ripe for gaming. Gotta keep that in mind for next year. 8. Bloggers Unite! 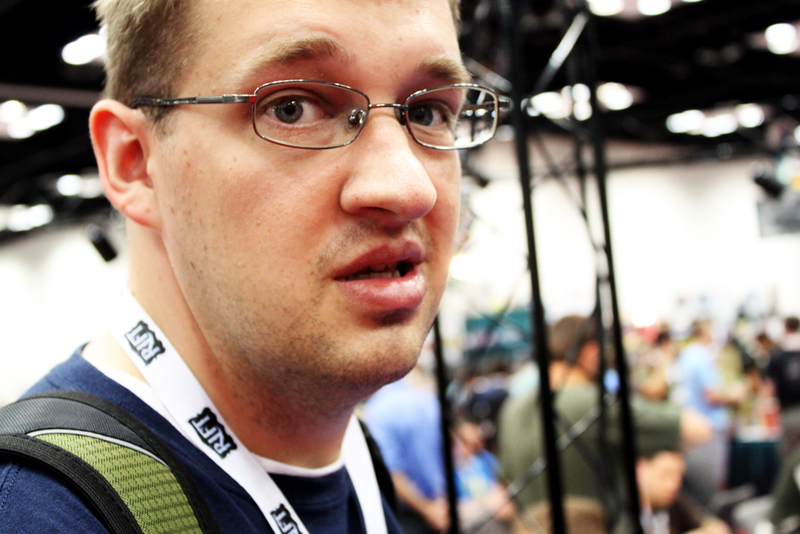 We managed to meet up with Board Game Josh (@BGJosh) and play a few games with him and his wife. As it turns out he is a pretty cool guy, albeit a very devious Resistance player. Both @FarmerLenny and I have been reading it for months, but you should definitely check out his blog as a (secondary, of course) source of board game info. 9. Most important thing to know about Gencon: Gencon is better with good friends. Wandering around alone can get you to a lot of places quickly, but nothing beats having your buddies there to try out new games with, play the games you’ve purchased, and trash talk each other through it all. Bringing @FarmerLenny and Blake along was the best choice I made regarding Gencon. Hopefully, iSlaytheDragon will be returning bigger and better next year. If all goes according to plan, we’ll write up the “DragonSlayer’s Guide to Gencon” shortly before next year’s convention so you too can be prepared. In the meantime, we’ll have plenty of reviews, news, and discussion in the days to come – especially after all the stuff we played at Gencon. Next Article Friday Question: What Is Your Favorite Two-Player Game? I’ve been underwhelmed by Rio Grande’s presence at Origins the last two years as well. I purchased from a booth last year and had a similar story about the promo card give-away. Took two eye teeth to get the Stash card which I still haven’t used. In any case, thanks for the review. I didn’t realize table space was at such a premium there. Origins has been my only big con and there are plenty of tables all over the place! Still, I need to experience GenCon…so next year, fingers crossed. In regards to board game space. The program mentioned that gamers could go to any Gen Con HQ desk and a volunteer would find them a table that they would not be kicked off. 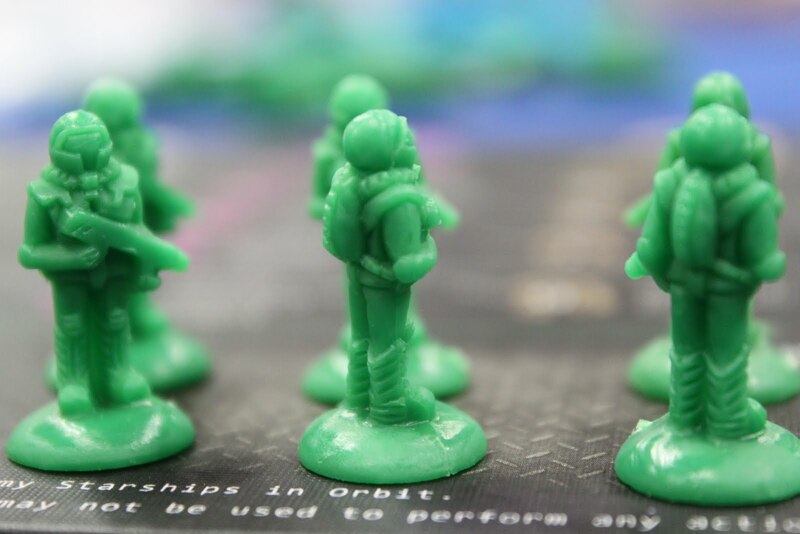 This was a policy change from previous years to address concerns from the board gaming community that there were not enough places for them to play pick up games in previous years. good to know, Jim. I hadn’t heard that. I’ll have to keep that in mind for next year as well.